Simple comme Bonjour! 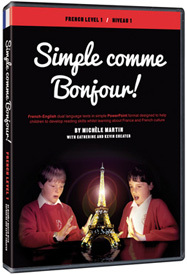 is a collection of French-English dual language texts in simple PowerPoint format, that have been designed to help children to develop their reading skills whist learning about France and French culture. At level 1 (niveau 1) these texts are the first in a series designed to help build confidence in reading, and are suitable for children in upper Key Stage 2 and lower Key Stage 3. These nine texts will delight young learners as they develop a pleasure of reading in French, and discover the delights of Paris and Brittany and many aspects of everyday life in France. I use this with year 6 as a way to get them reading longer texts in preparation for senior school. The topics of the texts are interesting and provide plenty of information about France and French life. They become subtly longer and more complex so there is good progression. The dictionary work, power points, comprehension sheets and crosswords are well made & allow pupils to develop skills, knowledge and vocabulary and we find ourselves having interesting discussions about translation, word classes, plurals and so on. Once the children have done a couple and are more confident, it's also a useful resource to leave as a cover lesson for a non specialist to use.